When we last left off in the blog, there was some drama surrounding Brett’s lost luggage. I am glad to report that it arrived at Palm Springs Airport on Friday morning, intact after a small tour of the southern United States. 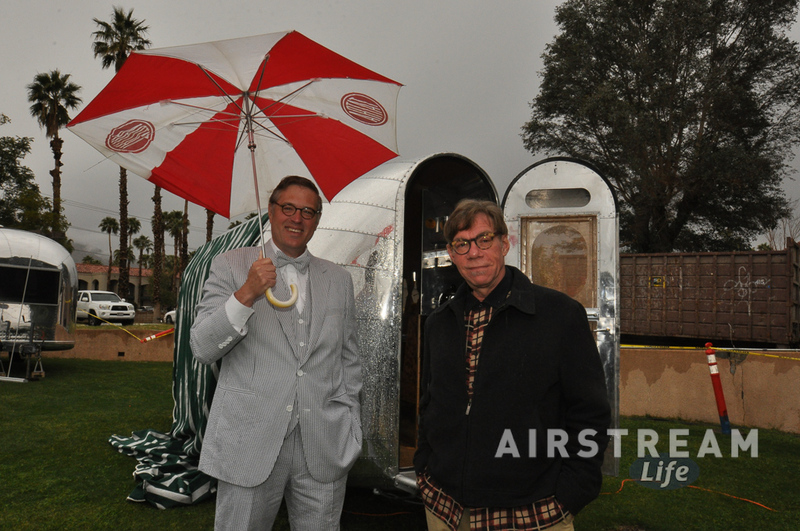 While we were glad to finally get it (and the important items it contained for Modernism Week’s Vintage Trailer Show), it was a small hassle because Brett had to take off with the car while we were in the middle of shoe-horning 19 trailers into a small space. This was far more logistically complex that you might think, since we had to juggle trailer spaces and vendors based on access, preference, electrical needs, and parking skills. Our parking plan had gone through six revisions before the show, and there were still several last-minute swaps required to squeeze everyone in there. That’s a 1935 Bowlus Road Chief, above, owned by John Long. In the midst of everything, I got tapped by a videographer to talk about the trailers, so I quickly winged a few comments and they spliced them together later. You can see the video here on YouTube. Still, it all got done by 2 p.m., and we got a short break to deal with our sunburns and hunger before meeting up with everyone at the Riviera’s “Bikini Bar.” We grabbed three of the curtained cabanas poolside and got a chance to chill out with the group. In the photo: Doug and Mona Heath, Kristiana Spaulding, me, Rob Super (with his homemade POP-rivet cap), and Kristiana’s husband Greg with his back to the camera. This was to be just one of the many socializing events, since Palm Springs is all about socializing. I had been feeling pretty ragged from lack of full sleep the previous few days, and combined with the hectic schedule and a sunburn, it was really starting to heap up on me. I managed to stay awake for Charles Phoenix’s show at 8:30, and it was worth it, but as soon as it was over I grabbed my chance and slept for nine hours. The weather forecast for Saturday was dismal: 90% chance of rain, and temperatures only in the upper 40s. In Palm Springs, that’s parka weather, and indeed we saw a few people in poofy down parkas and fur-lined hoods. In the morning things were wet with fresh rain and the low clouds made the desert mountains look like Hawaii. We figured it could be a washout, but by 10:00 the rain was over and we started seeing patches of sunshine, then more and more until finally it was a fairly decent day. And the Californians started to arrive, hundreds of them. The trailer owners were in their element, talking restoration technique and historical details to everyone who came by. I spent the morning shooting interiors (many of which you can see on my Flickr album), which was great in the morning with nice even light and few people crowding the trailers. By afternoon there wasn’t much for us organizers to do, so Brett, Alison Turner, and I snuck off for a leisurely lunch in the hotel. This was the first time we’ve ever been able to leave a trailer event that we’ve been organizing. Usually we don’t get a chance to breathe, much less eat, so this was a huge treat. It felt like skipping class. The show was scheduled to end by 2 p.m., but of course nobody wanted to leave, so it was well past 3 p.m. before the doors started closing. We recruited some help from David Winick and his daughter Rebecca to count the ballots for the evening’s presentation of the Airstream Life “Wally” awards. “Excellence in Modernism” went to Marty Snortum and Neveena Christi for their incredible 1960 Holiday House. 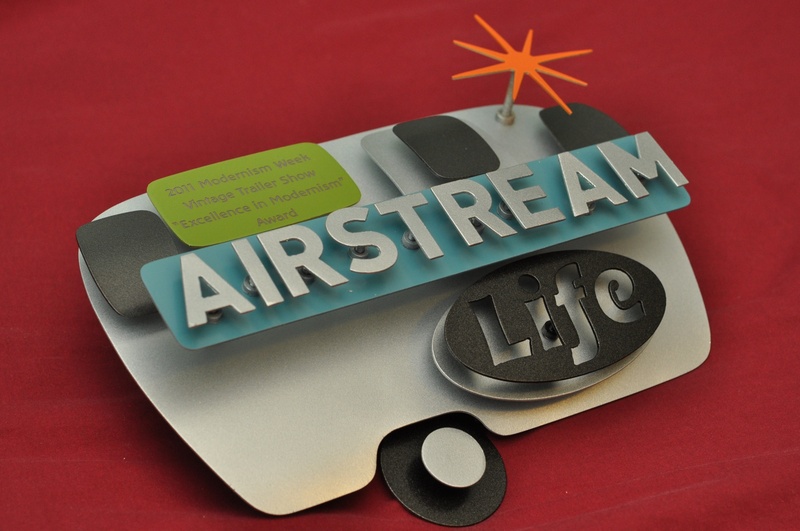 “People’s Choice” went to Doug and Mona Heath for their beautifully redone 1969 Airstream Tradewind. “Owner’s Choice” went to Eric Bescoby for his amazingly restored 1948 Spartan Manor. All of the trailers were incredible, well-received, and well worth seeing. Congratulations to the winners for their exceptional trailers! And this evening we went out for dinner with our friends the Fabers, in downtown Palm Springs, with a stop at Lappert’s for ice cream. Not a bad day at all, and the best part is that we get to do much of it again tomorrow. Finally my long-awaited trip to Palm Springs for Modernism Week 2011 has begun. 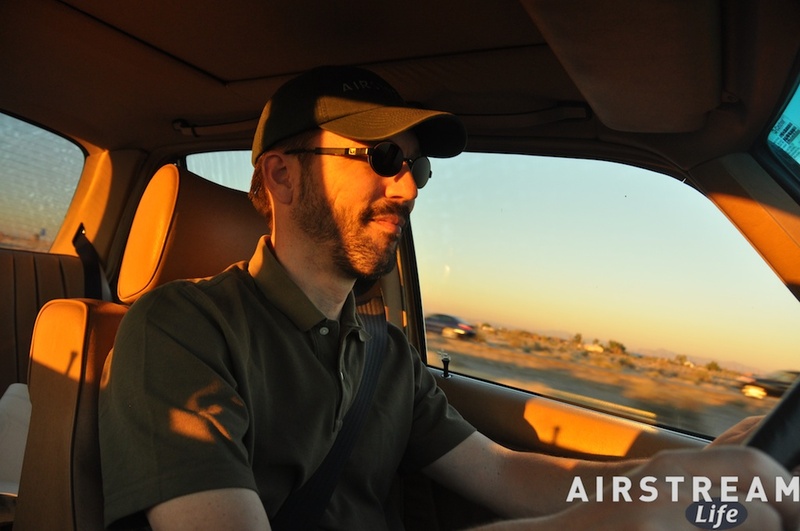 I was sort of chafing the last few days, eager to get on the road, and filling my time by triple-checking lists and over-preparing the car for every possible contingency. Yesterday morning I was up at 5:30 a.m. even though I didn’t need to leave until 9. After a few hours of trying to pace myself as I completed the final pre-departure tasks, I gave in, stuffed the last few things in the car, and set off up I-10 toward Phoenix. Now, one of my few concerns about this trip was whether the old car would make it. There was really no reason to think it wouldn’t, given that it has been well-prepared and recently serviced, and I will cut to the chase by telling you that it did just fine for the 380 miles to Palm Springs. The real issue turned out to be the airlines. The plan was for me to meet Brett at Phoenix Sky Harbor International airport around noon, and head out from there together to Palm Springs. I got into Phoenix early of course, so I had plenty of time to swing by one of the local biodiesel producers and pick up 5.5 gallons of B99 to top off the tank. Brett landed only about 10 minutes late, so all things looked good until we went looking for his luggage, which of course … (do I have to even tell the rest of this story)? Well, I’ll spare you the ugly view we got of the workings of an airline’s baggage handling system. In short, we went on to Palm Springs because the bags were in Houston and not likely to arrive soon enough for us to keep our schedule for the day. We were told that the bags, which contain a few vital items for the Vintage Trailer Show, would be forwarded on to Palm Springs by transferring them to another airline. When we arrived in Palm Springs we found John Long and his stunning 1935 Bowlus already set up on the grass display area behind the hotel, a day early. He worked out special permission to set up early, unbeknownst to us. (I believe that is the first time I have ever written the word “unbeknownst” in a blog entry, and I think after looking at it in this context, it will be the last.) John surprised me by looking admiringly at the old Mercedes, which was idly clattering away behind us as we greeted John. I think he appreciated it as a piece of industrial design much like he appreciates his own Bowlus travel trailer. Brett had by this time received two phone calls from his airline with various explanations and plans related to the retrieval of his baggage. The ultimate solution — so we thought — was to drive over to Palm Spring International Airport and pick up the bags from the 7:15 flight of the “other” airline. But when we got there, we discovered the flight had been canceled. So, back to the hotel, and another round of phone calls. At 9:15 we were back at the airport. I sat in the car curbside for a few minutes (thinking this would be a quick errand), but when the police chased me away a few minutes later I realized that things were not going well inside the terminal for Brett. I sat in the Cell Phone Lot until 10:30 while Brett went through these stages: (1) Looking for bags on the carousel; (2) Realizing the bags were again lost; (3) Dealing with an unhelpful “other Airlines” representative who told him he knew nothing about the situation and could not track the bag without a claim number; (4) Calling his first airline multiple times only to be told, “The other airline has the bag now, in Phoenix, and we don’t have a tracking nunber for it”; and finally (5) Conceding defeat at 10:30 pm, and heading off to the grocery store to buy a toothbrush. At dawn he was at it again, and the latest word is that the baggage will arrive sometime today on some flight to Palm Springs, and it will either be delivered by courier to the hotel or Brett will have to take the Stuttgart Taxi to go fetch it. In other words, we know nothing except that in theory the bags still exist on some existential plane of the universe. But hey, I won’t tell anyone Brett is wearing all the same clothes from yesterday. All we’re doing is parking trailers and greeting people today, so he doesn’t need to look sharp until tonight when we have a private reception for the trailer owners. By then, the baggage might be here, and we can concentrate on the thing we are here to do, which is to put on an awesome vintage trailer show this weekend. There’s always something to be learned from even the most unfortunate circumstances. 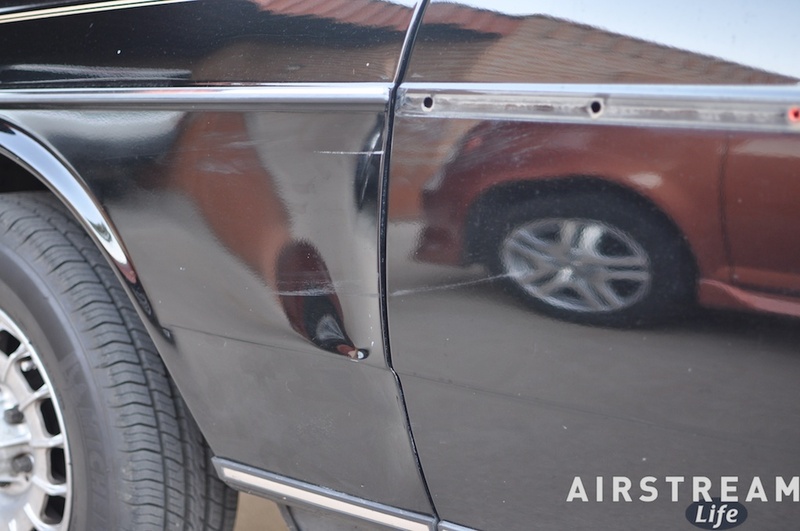 Last night, cruising in the car near sunset, my black Mercedes 300D was whacked by a dog. No, I didn’t hit him — he hit me. But he wasn’t killed. He bounced off the car, and ran back across the roadway. I stopped, but again I only got a glimpse of the dog as he high-tailed it back to the side of the road. I grabbed a piece of door trim that had been ripped off the car and then made the first possible U-turn back to the scene. There I found a lady who was holding the dog by the collar and petting him reassuringly, while talking on her cell phone to the owner (the dog had good tags). He appeared not only completely uninjured, but quite happy about his circumstances, doing all the usual yellow lab things like grinning foolishly and panting and inviting me to pet him too. There was some concern that the dog might have a concussion, especially after we got a good look at the large dent his head put in the steel fender of my tank-like Mercedes, so when the owner arrived we encouraged him to take the dog to a vet for a good check. Well, I hope he’s OK. He seemed like a nice dog, even if not too savvy about traffic. And I suspect his owner has learned a lesson too. But wouldn’t you know, the damage estimate came in at $785, which will not be covered by insurance since I carry only liability on that car. So now I have a good reason to have a chat with the dog’s owner. At the time of the incident I got only a phone number, because (stupidly enough) I didn’t have a working pen in the car. We were in a hurry to see the dog off to a vet, so I didn’t press further. Yes, it doesn’t take much to leave a big footprint on the Internet. (I’m sure mine is far larger than I want it to be.) But with Facebook, Twitter, mySpace, etc., some folks are especially discoverable. The relevant info will go to my insurance company and they’ll see about getting some compensation for the damage. In the meantime, I have decided to take the 300D to Palm Springs tomorrow as planned. I was able to reattach the door trim with new clips from the local dealer, and with that in place the rest of the damage isn’t terribly embarrassing. The paint is mostly OK, and this is the desert anyway, so rust won’t be a big issue. I’ll get it fixed in a couple of weeks. 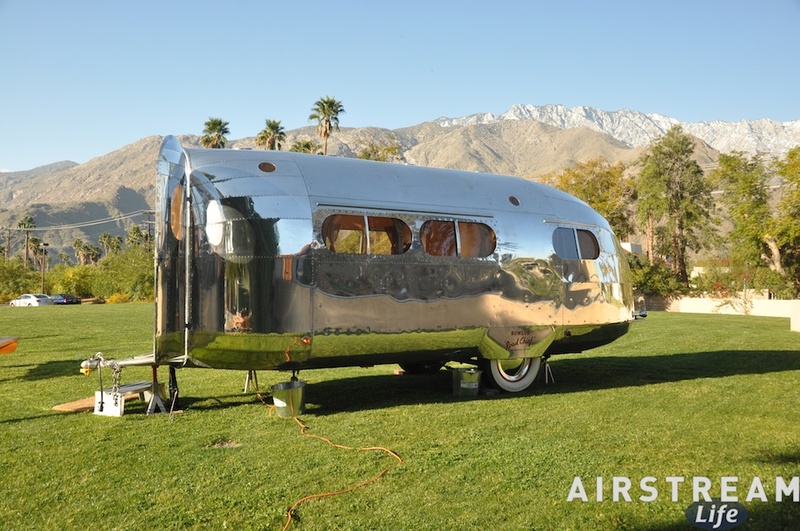 If you are coming to Modernism Week to see the Vintage Trailer Show, please avert your eyes from the driver’s side front fender and help me pretend that my car didn’t just get rammed by a hard-headed labrador. 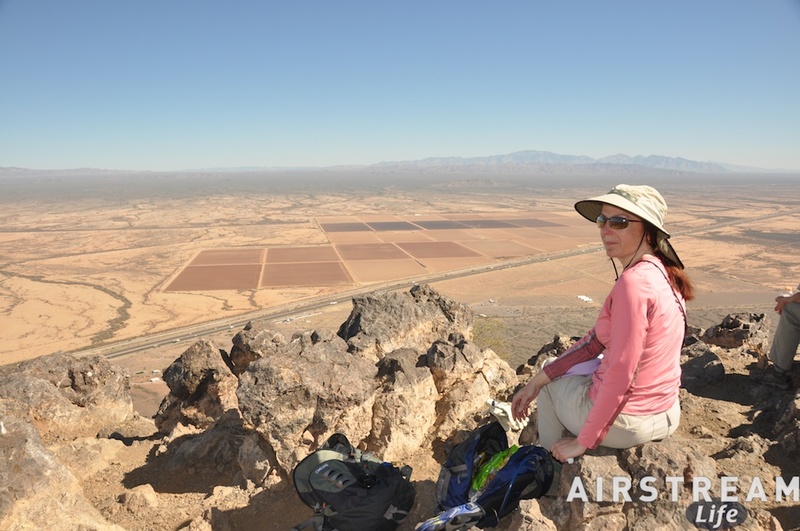 The first and only time I hiked Picacho Peak, that impossibly towering mountain alongside I-10 between Tucson and Phoenix, I did it with Brett on a 100-degree day. That was perhaps not the best choice for a steep rocky climb that offers very little shade. This time, I vowed to do it in the ideal season, which is about now, when we are getting lots of days in the low 70s. The Hunter Trail is 2.1 miles. The first half is an ascent composed of many switchbacks up the steep eroded slope of the mountain’s south side. It is in some ways the hardest park of the hike only because the slog up is fairly dull, and this presents a psychological challenge to some. 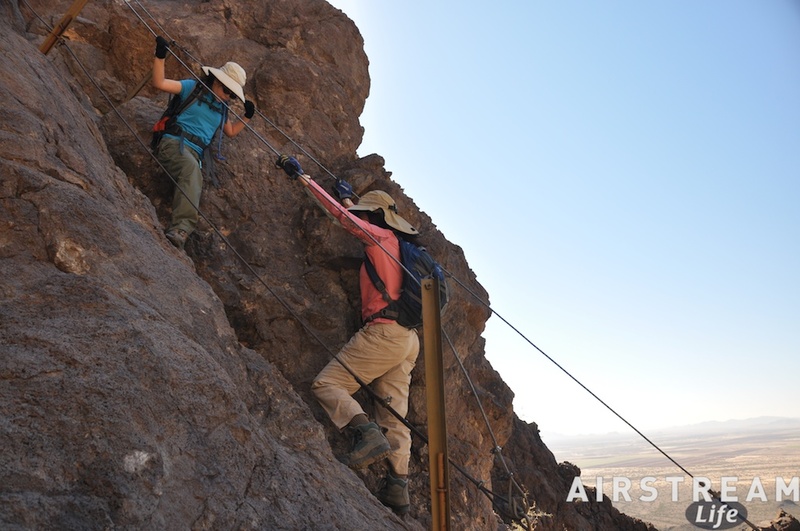 But if you get discouraged, you need only pause and look back down at the increasingly vast view of the desert floor for a little encouragement. You’ll see the dual ribbons of Interstate 10, the parallel Southern Pacific railway, and a wriggling stretch of the Central Arizona Project canal that feeds water to Tucson. Most people will need to pause frequently, just to catch their breath, so the excuse of “taking in the view” is pretty useful. The mid-point of the hike is a spot called “the saddle.” From this point, you face another psychological challenge: after all that climbing, you must now begin to descend the north side along an extremely steep and rocky “trail.” It is so steep that a cable line is provided, and you quickly give up a couple hundred feet of hard-won altitude as you proceed. Just a look at this descent is enough to scare people into deciding that they’ve done enough for the day, and to begin heading back to the car. The second half of the trail has nothing in common with the first half. It’s mostly solid rock, jagged and rough, with many ridiculously steep sections that are closer to rock climbing than hiking. Cable lines are everywhere, and for good reason. Those prone to vertigo or fear of heights should stay home. But spectacular views and the exhilaration of overcoming the tough spots are the rewards for those who persevere. There were a few points at which I wondered if our entire group was going to make it. Of all of us, I think Emma did the best. She showed no fear at any of the tricky stuff, never ran low on energy, and managed even the most technical bits with little help. Eleanor had to deal with asthma on the way up, and Alex was having some pain in his knees. But we all made it: We reached the summit in about two hours without loss of life or even minor maiming. Charon seemed the most psychologically stressed by the hike, yet she was the one who suggested we make this an annual ritual. That’s the kind of person she is. Faced with something that pushed her personal boundaries, she decided not only to finish it, but also commit to going back for more. Admirable. I understand how she feels about it. 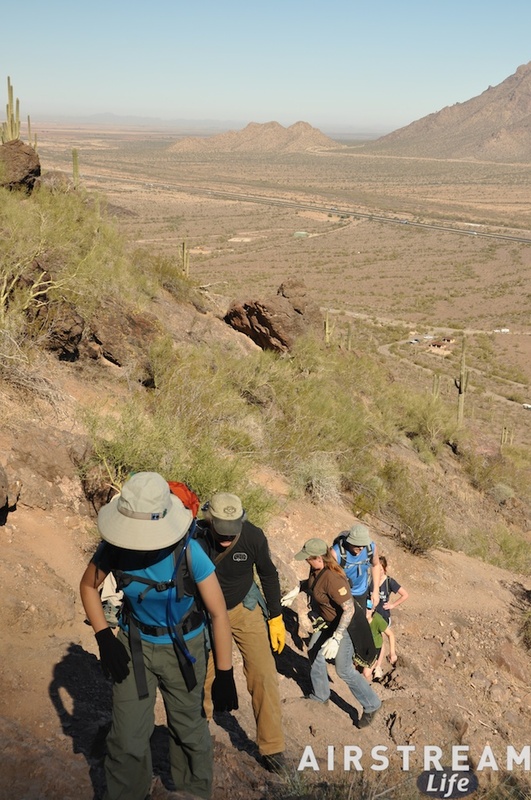 Climbing Picacho next year will be kind of a reminder to all of us to keep challenging ourselves. 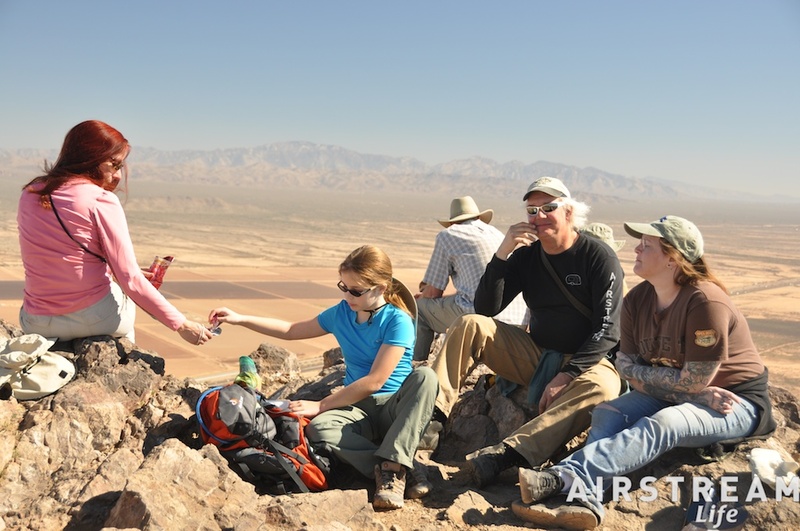 The summit of so many mountains is nothing special, usually just a view and a chance to eat a few snacks while cooling off, but it’s a great feeling to bag a peak that you’ve worked hard on. Even little Picacho, at about 3,300 ft, is a great achievement if you weren’t sure you could make it. I think that it doesn’t matter how tall the mountain is, or how easily other people have reached it. Getting there is your achievement, forever. Well worth a Saturday and a little sweat. I’ve got a roadtrip coming, and I’m psyched about it. You’d think that after years of traveling by Airstream I might be a little jaded by the thought of yet another cross-country drive, but not so. The fact that I’m always looking forward to the next trip tells me something good: I like what I’m doing. That’s kind of my ideal for life, to have a sense that most days I am doing what I want to do. This trip is particularly exciting because I’m taking the vintage Mercedes 300D for its first big highway excursion. 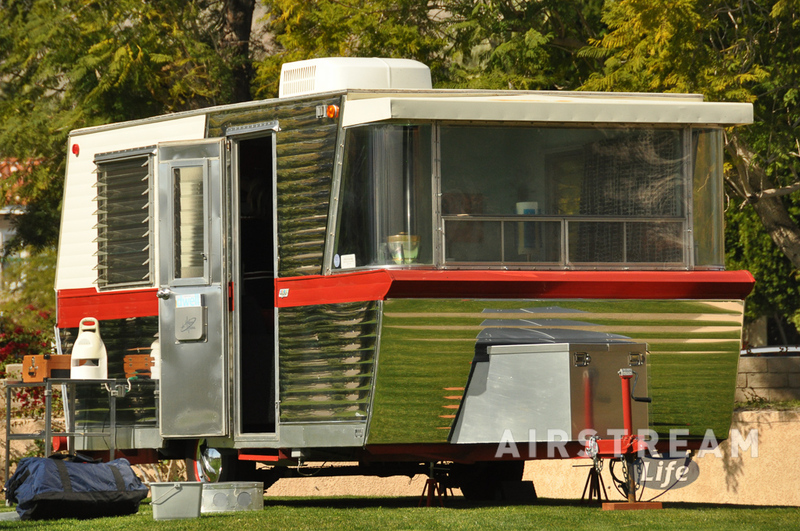 We’ll be going to Palm Springs, California for the Modernism Week Vintage Trailer Show. No, I’m not going to be towing a trailer this time. 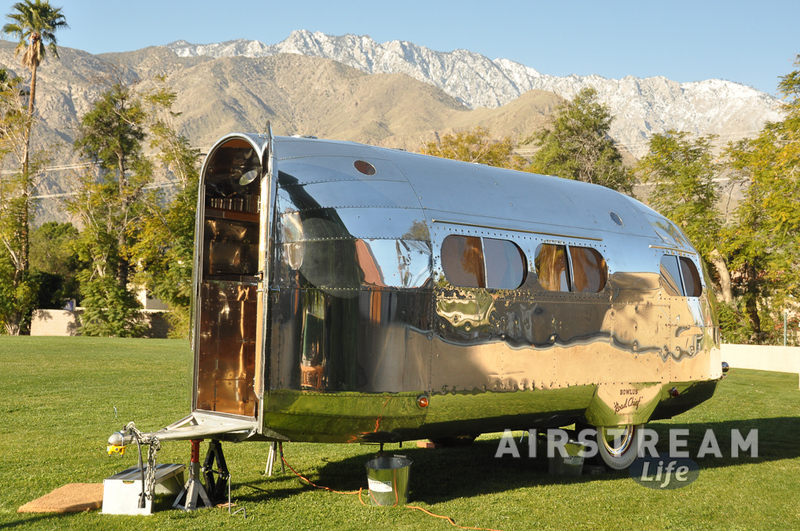 I would have brought the 1968 Airstream Caravel, but through a series of events we ended up with 20 trailers in the show instead of the 18 we had space for, and I had to give up my own space so that we could fit them all. So I’m staying in the Riviera Resort & Spa (the venue for the event) and won’t be bringing the Caravel this year. But the loss of my trailer space was a blessing in disguise, because the old Merc should fit in better with all the old trailers. I’ve wanted to get that car out for a good stretch of the legs anyway. 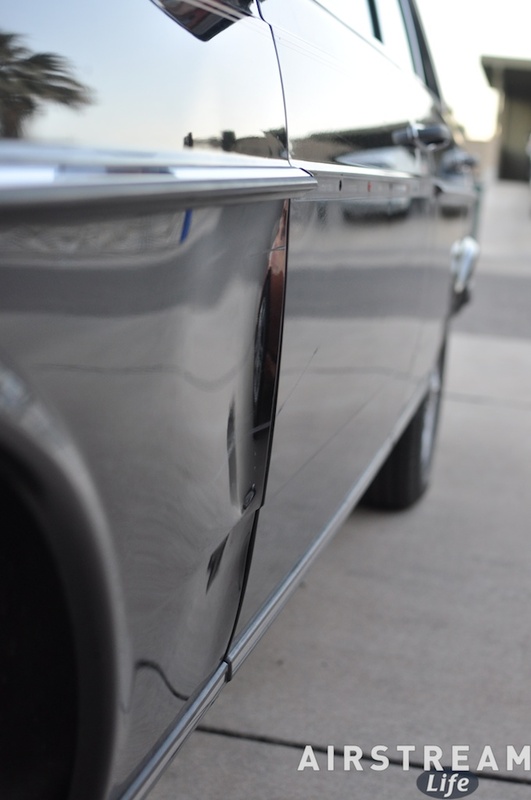 My recent trip to Phoenix showed that these W123-chassis sedans deserve their reputation as fine highway cruisers. A 350-mile run across the desert seems like a great roadtrip to me, and this is the ideal time of year to do it. Once the heat arrives in May, the old car’s air conditioning will be severely challenged. Late February and March in the low desert is the season to roll the windows down and let the wind blow into the cabin. I have to admit that this time I’ve had more trepidation about the possibility of a breakdown than I’ve ever had towing an Airstream. On the day of the trip I have to drive 100 miles up to Phoenix, pick up Brett at Sky Harbor International Airport, then continue to Palm Springs and arrive by dinnertime. There’s not much room for sitting beside the road waiting for roadside assistance. A 27 year old car with 167,000 miles on it is perhaps not the best choice when you absolutely positively have to be in Palm Springs to coordinate 20 trailers. But the old Mercedes diesels have a fantastic reputation for running even when they should by all rights be having parts stripped off them at a junkyard. And with good maintenance, there’s absolutely no reason this car won’t go across the USA and back with 100% reliability. It’s really a matter of taking care of your vehicle and proactively maintaining things rather than waiting for them to break. But still, it’s good to be prepared. And as I’ve noted before, prepping for a roadtrip can be a huge part of the fun. This time I’ve been researching common problems and the tools needed to overcome them, and gradually collecting the tools I might need along the way. The old Mercedes are very well designed for servicing, to the point that it seems 90% of the repairs you might need to do along the road can be accomplished with a socket wrench and an extension, three or four sockets, and a couple of fuel filters. I’ve added a few Mercedes-specific items, like a lug bolt guide tool to help with tire changing, some of the odd “festoon” light bulbs used in interior lamps, and the unusual ceramic fuses, plus a quart of oil. 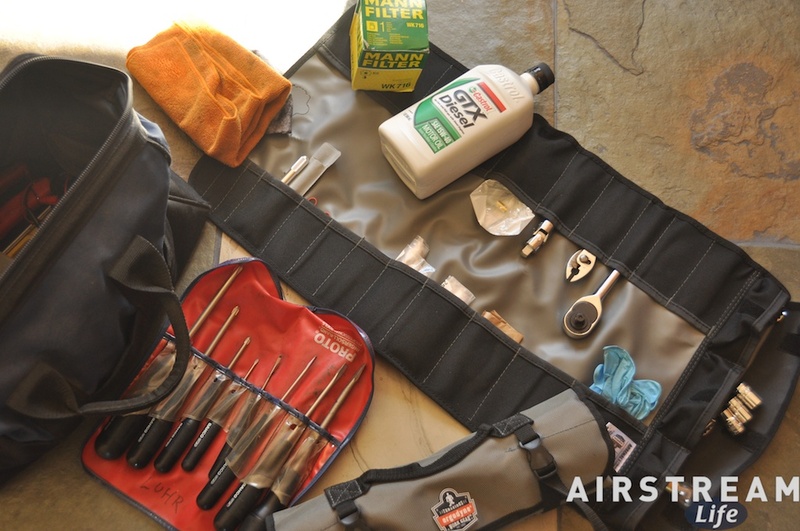 With the addition of my well-stocked Airstream kit bag, I can pretty much disassemble and reassemble half the car, and that should be much more than I’ll ever use on this trip. In fact, I will be surprised if any of the tools come out of the trunk at all. I’m just being overly cautious. One of the fun bits is that I will be running the car on biodiesel for at least the first half of the trip. Biodiesel is amazing stuff. It’s made from vegetable oil, so it’s almost carbon-neutral. Running B20 (20% biodiesel, 80% dino diesel) cuts most pollutants in the exhaust considerably, which is nice since this is a 1984-era car that isn’t nearly as clean as my 2009 version diesel with the built-in chemical processing plant. Biodiesel is biodegradable and completely non-toxic, so spills or human contact are not much of a problem. It makes the car run a little quieter, cleans out the fuel system (because it is a solvent), and — best of all — it makes the exhaust smell like vegetable oil (reminds me of making popcorn). The only problems I’ve found is that 100% biodiesel is a bit expensive, currently $3.94 per gallon in Tucson, and it will require me to replace the rubber fuel lines soon with a different type that isn’t degraded by contact with it. See? I’m geeking out about it. I love it when, rather than mixing business and pleasure, business is pleasure. It’s not always that way, and in fact I can think of a lot of times I’ve hated what I had to do, but on balance the times like this make up for it. Just a simple roadtrip — but it’s going to be one of the highlights of February and a memorable experience for years to come. I can’t wait to get rolling.